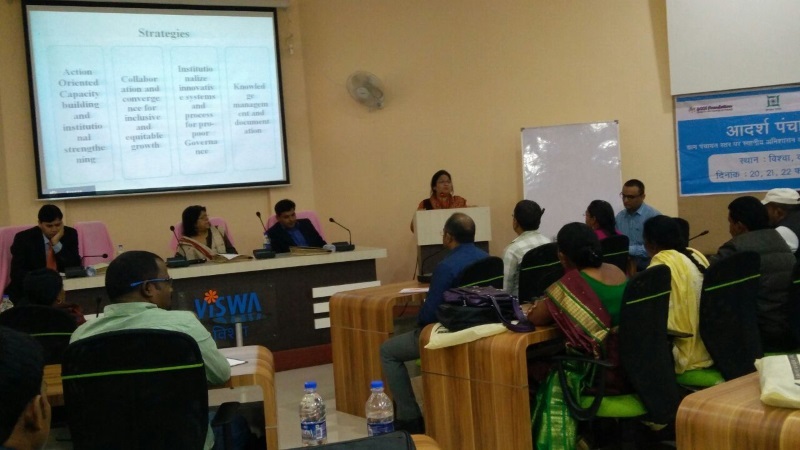 Picture shows the scene of the workshop inside Vishweshvaraiya Institute of Sanitation and Water Academy,Kanke,Ranchi on February 22,2017. The three-day workshop on Mukhiyas and Deputy Mukhiyas was held at Vishweshvaraiya Institute of Sanitation and Water Academy,Bazar Tarnd,Kanke,Ranchi on Tuesday.The workshop, orgainised under the banner of Adarsh Panchayat Pariyojna,jointly by UNICEF,Jharkhand,State institute of Rural Development (SIRD) and Vishweshvaraiya Institute of Sanitation and Water Academy on February 20-22, was attended by Mukhiyas and Deputy Mukhiyas of 25 Panchayats of five blocks of the equal number of districts in Jharkhand. The workshop was addressed among others by Principal Secretary(Rural Development)N.N.Sinha,UNISEF,Jharkhand's Madhulika Jonathan and SIRD Chief Mridula Sinha.